Stopped at Starbucks on the way to work, and while walking in, I noticed a duck standing on the sidewalk next to the fairly busy street. 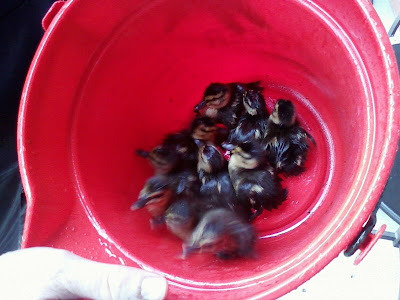 On my way out, a guy coming in started talking to me about the duck, and I eventually figured out he was saying there was a bunch of ducklings trapped down in the storm drain, and the duck on the sidewalk was mom. Walked over there, and mom duck was squawking away, obviously upset about something. 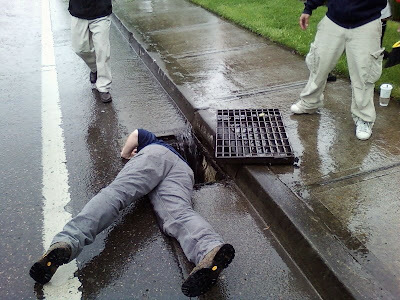 So that guy and I applied big brute force to get the storm drain grate out and up onto the sidewalk. The ducklings (I counted 10 of them) were just out of arm's reach down there, bobbing around in the current, and occasionally drifting out of site into the adjacent piping. I got down on the street on my belly, with legs hanging out into traffic, but couldn't quite reach them. A Starbucks employee then came out, and then a guy from another store nearby. I figured out that someone with longish arms holding a bucket should be able to reach them, and told the Starbucks guy to go find a bucket. 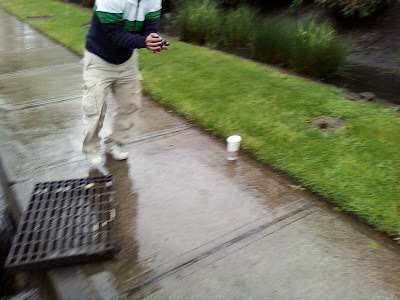 He got that, and we directed traffic out of the way, and then we proceeded to scoop out the ducklings. We got all 10 of them gathered up, and took them over to the pond behind the Starbucks, which is probably basically where they belong. Couldn't tell where mama duck was, but I'm sure she was nearby. She had walked away when we came over to the grate. Naturally, it was absolutely pouring down rain the whole time, and I got soaked, and my jeans got very wet from lying in the street, and from having cars go by, and I got chunks of dirt and stuff in my hair, but it was a good feeling to help rescue the little guys. Took a few cell phone pics.